BBC Radio 3 - The Story of Music Question Time, Where Have We Come From...And Where Are We Going? Where Have We Come From...And Where Are We Going? Sue and Tom discuss who created the first piece of music, argue over how you can define what music 'is', anyway. If you could ask BBC Radio 3 one question about music, what would it be? Sue Perkins and Tom Service are here to unravel everything you've ever wondered about music - but were too afraid to ask... Send YOUR questions to r3qt@bbc.co.uk, tweet with the hashtag #r3qt or post them on Radio 3's Facebook page at www.facebook.com/bbcradio3. Who created the first piece of music? Why does music have such a powerful effect on us psychologically and emotionally? And how do you define what music really 'is', anyway...? 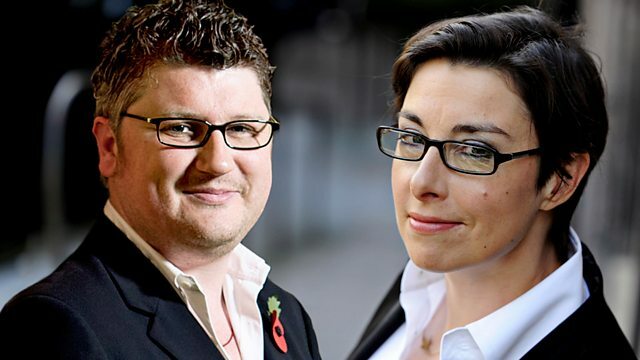 Comedian Sue Perkins joins Tom Service for the first in a new series of Radio 3's "Question Time", as part of the BBC's "Story of Music" season - every Monday evening in the interval of "Radio 3 Live In Concert". And they need YOUR questions to answer throughout the series! Send in your queries about anything musical to r3qt@bbc.co.uk, tweet with hashtag #r3qt or post them on Radio 3's Facebook page: www.facebook.com/bbcradio3. We'll be looking out for them! Conductor: James Culley Performer: Cincinnati Conservatory Percussion Ens.